Oozing with charm, this delightful detached barn conversion offers comfortable accommodation with many original features including beamed ceilings and slate floors. Set in 4 acres of land bounded on one side by the River Kensey, which nestles in a small hamlet in the Kensey Valley,the property allows guests to enjoy the quiet seclusion of the countryside with plenty of space to relax or play in. 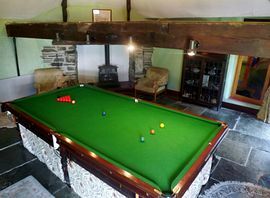 Tre, Pol and Pen amenities include a snooker table, an outdoor solar heated swimming pool in the bottom paddock (a real suntrap - open May to September ) reached by either steps or down a lane, table and chairs for 12 people, a gas barbecue, summer house. together with a play area for children including 14' trampoline with safety enclosure, swings and slide. On the 1st floor level there is an 8 sided "Round Room" formerly a horse engine which houses a 10' x 5' snooker table. 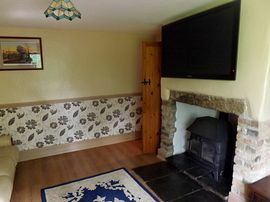 The room has a woodburner, gas coal effect stove and slate flooring and seating. On the ground floor there is a smaller lounge with50" Plasma TV with Sky satelite TV including sky films, Dvd, accesible WiFi Broadband internet connection, and gas coal effect fire, and 3 piece cream leather suite with integral double fold out bed. 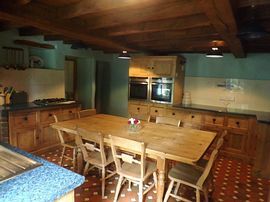 The kitchen is a well equipped farmhouse style with exposed beams, pine table and 12 chairs, large dresser, twin single neff ovens, microwave, fridge, dishwasher, gas hob together with a gas coal effect stove. There are 5 bedrooms which consist of the master with a Super King Size bed, Balcony, walk in wardrobe, oak chest of drawers and bedside tables and En-Suite bathroom with corner bath,basin, bidet and WA. Bedroom 2 with a King Size Bed, pine wardrobe and chest of drawers together with En-Suite Bathroom with corner Bath,vanity unit and WC. Bedroom 3 is a twin bedroom with 3' beds, washbasin, chest of drawers, clothes hanger and bedside table. Bedroom 4 is a double room with King size bed, washbasin, pine chest of drawers and two bedside tables and clothes hanger. Bedroom 5 is a single room with a 3' bed, washbasin and chest of drawers and bedside table. Additional sleeping accomodation is made up of an integral fold out double bed in leather settee in ground floor lounge. There is also a single and double "Z" bed for more scope. A travel cot is provided but please supply your own bedding. Bathrooms:In addition to the 2 en-suite bathrooms There is a seperate shower room with massage shower, wc and basin. The utility room houses the deep freeze, washing machine, tumble drier, sink and toilet and hot water boiler. From Launceston take the road to Egloskerry, continue past Egloskerry towards Tresmeer for 1.75 miles, Tre Pol and Pen is down a lane on the left hand side of the road marked Lanzion. Bed Linen, Duvets and Towels are included. Towels must remain on the premises. 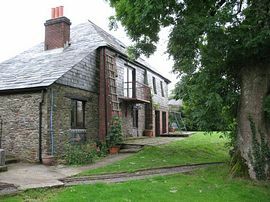 As described the property is set in a hillside and as such there are certain areas that are unsuitable for unsupervised children. There are areas with unfenced river. There is a miniature railway that runs through the grounds that will not be in use. Any facilities are used entirely at your own risk. As with all properties set in the countryside we cannot guarantee against spiders and other country creatures and cobwebs can appear almost as soon as they are cleared and this in no way reflects on the cleanliness of the property. The owners reserve the right to withdraw amenities at their discretion. TV reception can be affected by atmospheric conditions. You are expected to leave the property in the same clean condition it was found. A travel cot is supplied (but does not include bedding). 1/3rd deposit at time of booking, if booking is less than 8 weeks before the holiday the full cost of the holiday is payable, once confirmed the customer is liable for the full cost of the holiday, the balance being due at least 8 weeks before commencement of the same. On fortnightly bookings a change of bedding will be provided but no internal cleaning will be carried out. Central heating is not provided from May � September. The woodburner is not available for use during the holiday season as the chimney is capped to stop the ingress of birds nesting please do not attempt to light but there is a gas coal effect fire to use in the same room. The customers are responsible for their own holiday insurance to cover against cancellation etc. Any damages/losses will be claimed from the customer and we regret this year we will have to charge a £100.00 deposit for damages per week. This deposit will be refunded in September if no damage is incurred. In the event of the property becoming unavailable for rent due to unforeseen circumstances i.e. Fire/Death/Flood etc. a full refund would be given. Please note bookings are taken on a first come first served basis. 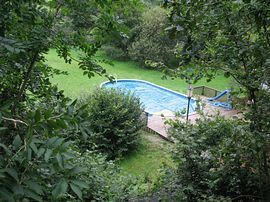 Great holiday, fantastic house + grounds, really enjoyed the pool, spent most evenings in the games room, Let us know when you're ready to sell. Thanks We'll be back.